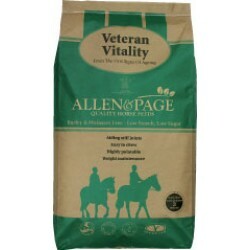 Allen and Page is a horse feed company who set out to help owners feed their horses as naturally as possible, and to make really useful horse feeds for specific nutritional requirements. From laminitics to nutritionally deprived to dentally challenged, they cater for all; and their nutritional helpline is staffed by qualified people who are helpful, knowledgeable and happy! Blending state of the art technology and bang up to date nutritional science they were the first to receive approval from the Vegetarian Society and led the field using Non-GM ingredients. Ethically conscious and environmentally aware, by their own admission Allen & Page are not just about selling feed (although they do supply HRH The Prince of Wales). They are all about doing the right thing – ethically, nutritionally and environmentally; and they have been doing just that, for generations. It is a genuine pleasure to deal with them, and I have been doing just that, for more than a decade.